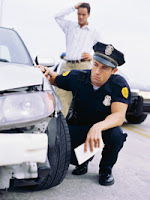 The police report, accident report or crash collision report prepared by the Albuquerque Police Department (APD) or Bernalillo County Sheriff Department (BCSO) is the best way to determine who was at fault for your car accident, truck accident or motorcycle accident. 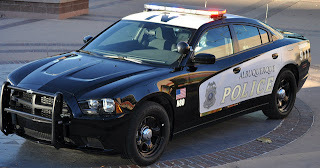 If you have been in an accident in the Albuquerque area, then most likely an APD officer or Sheriff deputy showed up at the scene to investigate the accident and prepare the accident report. At the scene, the officer talked with the drivers of the vehicles and any witnesses who presented themselves to him/her with information about the collision. The officer most likely took handwritten notes of the individuals which will be typed on to a computer form. The officer will also assess the amount of damage and location of the damage to the vehicles and other property that might have been involved. The officer will also look for other physical evidence such as skid marks, broken glass. Most importantly the officer will assess the actual location of the accident taking into consideration the number of lanes, traffic control devices like stop signs and traffic signals and the amount of traffic. The officer will also note any complaints of personal injuries from the collision. Based on his/her own training and the laws of the state of New Mexico, the officer will determine which driver was at fault. In some instances, the officer will cite one of the drivers. Normally the officer will not give each driver any information on the other driver. Instead, the officer will give you his/her business card with the accident report record locator number written on the card. The officer will tell you that the accident report will be available in 7 to 10 days. The APD officer or Sheriff deputy will then enter all the information from the handwritten notes on to a computerized form approved by the State of New Mexico. The report includes all of the information discussed above, but the report has a separate section called “Contributing Factors“. It is this section that is the most important section of the report, because it determines who is at fault for the collision. Let me explain to you how to read this section. Each “Contributing Factors” section on the accident report identifies a specific vehicle such as vehicle 1, vehicle 2, vehicle 3, etc. You will need to look at the first few pages of the accident report to determine which driver and vehicle you are to determine which section of the “Contributing Factors” applies to you. So, if you are vehicle/driver one on page 1 of the report, then your “Contributing Factors” are only those listed for a vehicle on about page 3 of the report. A perfect notation in the section would be something like “No Contributing Factor” or “None” meaning that you did absolutely nothing to cause the collision. Other notations like “Speeding Too Fast for Conditions” or “Failing to Yield” or “Disregarding Traffic Controls” mean that you caused the collision. In my experience as a personal injury attorney, I believe that the “Contributing Factor” section of the accident report is the primary factor that insurance companies and attorneys use to determine who is at fault. The officer is the best person to make a decision on who is at fault for the vehicular collision. He is at the scene minutes after the collision. The officer can judge the character of the drivers and witnesses to help determine who he/she believes is telling the truth. The officer sees the physical evidence and the location first hand. If you review the accident report prepared by the officer and find errors, you can file a supplemental report to be attached to the accident report. You can do so by taking the original report with you to the local APD or BCSO office and requesting a supplemental sheet. You can handwrite your version of the collision together with the accident report number appearing on the original accident report and submit it to the staff at the office. Witnesses who are not listed on the accident report are not very credible. The exception is the witness who may be noted on the 911 transcript. It is important to get a copy of the transcript from the APD or BCSO if the fault of one of the parties is important. Often times the transcript will indicate that a particular witness used his/her cell phone to report an accident that they actually witnessed. However, because of time constraints they did not stop to talk with the individuals involved or wait for the investigating officer. If you have questions concerning your vehicle accident please contact Caruso Law Offices at 505-883-5000 for a free consultation. Also, visit our web site at www.carusolaw.com We only handle personal injury and wrongful death cases as a result of a car, truck, motorcycle, bus, bicycle or pedestrian accidents.